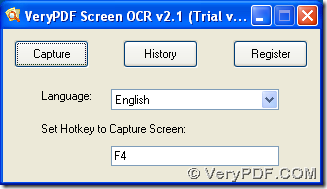 VeryPDF Screen OCR, which is one of software at VeryPDF website, is a smart screen capture tool and character recognizer that helps you extract character content from the screen to text files in both 32 bits and 64 bits Windows systems. VeryPDF Screen OCR allows you to capture all kinds of displays on screen to editable text files quickly and accurately than you can wish with popular OCR technology. How could we recognize screen text with VeryPDF Screen OCR? 1. 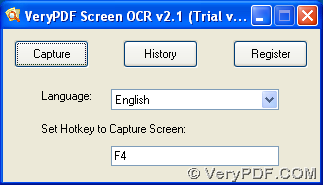 Open VeryPDF Screen OCR in your computer, then you can set hotkey for screen capture and suitable language for OCR technology. Then, please click OCR there so that VeryPDF Screen OCR helps you recognize screen text with OCR technology quickly. By now, it is the end to recognize screen text with OCR technology on Windows platforms. If you have more questions on how to recognize screen text with VeryPDF Screen OCR, please go to support team to sue help.